It was my mom who taught me to crochet when I was a little girl. As a child it was one of my favorite pastimes. I made crocheted clothes for all of my dolls and teddy bears. 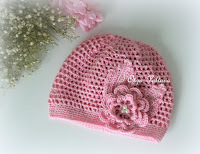 The hat bellow is similar to the ones I made for my dolls long time ago. It is made using double crochets and is super easy. Ch 5, join in ring with sl st.
Rounds 5-10: repeat Round 4. Round 11: *ch 3, 2 dc in same space, skip next 2 dc, sl st in next dc* around. Today I want to show off my recent crochet projects. All the patterns are available in my Etsy and Craftsy shops. Thank you for stopping by and have a wonderful week! Today I want to share a vintage doily pattern from Doilies Book No. 201, The Spool Cotton Company, 1943. For the doily shown, I used 1.25 mm steel hook and size ten crochet thread. My doily came out 12.5 inches in diameter (across). Starting at center, ch 10. Join with sl st to form ring. 1st rnd: Ch 1, 20 sc in ring – Sl st in 1st sc made. 2nd rnd: Ch 6 (to count as dc and ch-3), * skip 1 sc, dc in next sc, ch 3. Repeat from * around. Join last ch-3 with sl st to 3rd st of starting chain. 3rd rnd: Sl st in sp, ch 3, 4 dc in same sp, 5 dc in each sp around. Join. 4th rnd: Ch 3, dc in next 4 dc, * ch 1, dc in next 5 dc. Repeat from * around, ending with ch-1. Join. 5th, 6th and 7th rnds: Ch 3, dc in same place as sl st, * dc in each dc to last dc of group, 2 dc in last dc of group, ch 1,2 dc in next dc. Repeat from * around. Join. 8th rnd: Sl st in next dc, ch 3, dc in next 8 dc, * ch 3, sc in sp between dc-groups, ch 3, skip 1 dc, dc in next 9 dc. Repeat from * around. Join last ch-3 with sl st to 3rd st of starting chain. 9th rnd: Sl st in next dc, ch 3, dc in next 6 dc, * (ch 3, sc in next loop) twice; ch 3, skip 1 dc, dc in next 7 dc. Repeat from * around. Join. 10th rnd: Sl st in next dc, ch 3, dc in next 4 dc, * (ch 3, sc in next loop) 3 times; ch 3, skip 1 dc, dc in next 5 dc. Repeat from * around. Join. 11th rnd: Sl st in next dc, ch 3, dc in next 2 dc, * (ch 3, sc in next loop) 4 times; ch 3, skip 1 dc, dc in next 3 dc. Repeat from * around. Join. 12th rnd: Sl st in next 2 dc and in next ch, ch 1, sc in loop, * ch 4, sc in next loop. Repeat from * around. Join. 13th, 14th and 15th rnds: Sl st to center of loop and make ch-4 loops for 13th rnd; ch-5 loops for 14th rnd and ch-6 for 15th rnd. 16th rnd: Sl st in loop, ch 3, 4 dc in same loop, * ch 6, 2 sc in next loop, 3 sc in each of next 2 loops, 2 sc in next loop, ch 6, 5 dc in next loop. Repeat from * around. Join. 17th rnd: Sl st in next 2 dc, ch 3, dc in next 2 dc, * ch 6, skip 1 sc, sc in next 8 sc, ch 6, dc in next 2 dc, in next dc make dc, ch 4 and dc; dc in next 2 dc. Repeat from * around, ending with dc in each of 3 sl sts, ch 4, sl st in top st of starting chain. 18th rnd: Ch 3, dc in next 2 dc, * ch 6, skip 1 sc, sc in next 6 sc, ch 5, dc in next 3 dc, ch 4, sc in next loop, ch 4, dc in next 3 dc. Repeat from * around. Join. 19th rnd: Ch 3, dc in next 2 dc, * ch 6, skip 1 sc. sc in next 4 sc, ch 6, dc in next 3 dc, ch 4, sc in next loop, ch 5. sc in next loop, ch 4, dc in next 3 dc. Repeat from * around. Join. 20th rnd: Ch 3, dc in next 2 dc, * ch 6, skip 1 sc, sc in next 2 sc, ch 6, dc in next 3 dc, ch 4, sc in next loop, 15 dc in ch-5 loop, sc in next loop, ch 4, dc in next 3 dc. Repeat from * around. Join. 21st rnd: Ch 3, dc in next 2 dc, * ch 2, skip 1 sc, d tr in next sc. ch 2, dc in next 3 dc, ch 1, dc in next sc, dc in next 7 dc, 2 dc in next dc, dc in next 7 dc, dc in next sc, ch 1, dc in next 3 dc. Repeat from * around. Join. 22nd rnd: Sl st in next 2 dc, the following ch-2 and the d tr, ch 3, 2 dc in same d tr, * ch 3, sc in 3rd ch from hook (p made), 2 dc in ch-1 sp. (p, dc in next 2 dc) 9 times; p, 2 dc in next ch-1 sp, p, 3 dc in d tr, p. Repeat from * around. Join and fasten off.